Eliseev S.V., Sitov I.S., Eliseev A.V. The purpose of this work is to establish research methods mechanical systems with «not holding» ties. The problems of determining the mode of continuous flying up of a material particle from surface oscillations with the force of gravity are considered. The graphical-analytical method for determination of the mode parameters is realized. The analytical characteristics of the relations between the basic modes of continuous flying up of a particle as a function of the parameters of the surface vibrations are identified. The proposed methodological framework can be used to research the mode of continuous flipping with additional constant force which operate from the external environment in free flight phase. Keywords: not holding ties, interaction of a material particle with a vibrating surface, a mode of a material particle tossing with one contact. Loitsyansky L.G. Course of Theoretical Mechanics. Vol. 2. Dynamics / L.G. Loitsyansky, A.I. Lurie. – Moscow: Nauka. 1968. – 638 p.
Lurie A.I. Analytical Mechanics / A.I. Lurie. – M: Nauka. 1986. – 516 p.
Artobolevsky I.I. Theory of mechanisms and machines – M: Nauka. 1978. – 640 p.
Blekhman I.I., Dzhanalidze G.Y. Vibrational displacement. – M: Nauka. 1968. -316 p.
Selvinsky V.V. The dynamics of the contact interaction of solids. – Blagoveshchensk: Publishing House of Amur of public university, 2009. – 164 p.
Eliseev S.V., Markov K.K. Some aspects of the dynamics-rye oscillatory process with unilateral constraints // Mechanics and Control. – Irkutsk: IPI, 1971. – P. 71-83. Eliseev S.V., Lotkin O.I. Conditions of existence and breach of contact for systems with unilateral constraints // Proceedings OMIIT. – Omsk: OMIIT, 1966, Vol. 69. – P. 93-99. Gorbikov S.P., Neimark Y.I. The major modes of motion in vibro tossing // Math. USSR “Mechanics of rigid body”, 1981, № 4. – P. 39-50. Eliseev S.V., Eliseev A.V. Modes flip of a particle on a vibrating surface in the model problem with unilateral constraints. // Modern technologies. Systems analysis. 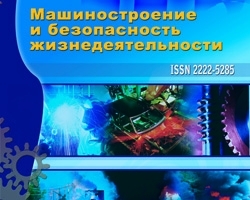 Modeling, 2012, № 3 (35). – P. 64-75. Eliseev A.V., Eliseev S.V., Motion of material particle with tossing in model problem with «not holding» ties, №3 (13) 2012, Sitov I.S.